In Khushwant Singh photographer Mustafa Quraishi found a grandfather he always wanted. My first memory of Khushwant Singh goes back to 1999 when (at the launch of his book The Company of Women), I took a picture of him planting a kiss over the cheek of (Pakistan envoy Ashraf Jehangir Qazi's daughter) Maha Qazi. Million marvels for the lovely photograph... The old sardar's lips have more punch than his middle. That was my first association with him. But my mother (the journalist and author Humra Quraishi) had known him much before that. She had gone through a divorce and he had been there by her side. Over time they’d become great friends. When you’re young and when you’re in the media, you don’t necessarily bother to keep in touch with people. And that was how it was with him too. I knew she knew him but I didn’t care much. It was only much later that I began getting close to him. The public perception of him is that he was a horny ba****d.
But in reality, he was far from it. To the women especially, he was like a fatherly figure and that was how his relationship was with my mother. In that sense, he was like my nana (maternal grandfather). He tried to pass himself off as my chacha (uncle) once but I asked him how could it be? You are like a father to my mum so that makes you my nana, I told him. I’d known him for more than 17 years and there has never been an eid when we hadn’t visited him. The visits may not have been very long but it was a ritual of sorts. Eid was never complete without having met him. He used to call us over and we used to go. His birthday was another occasion for us to celebrate. My mum and I would visit him on his birthday, yet another ritual that I broke this year. I couldn’t make it to his birthday celebrations. The last time we met was a few months ago. The age was taking its toll on him. He had stopped writing his column; he had a male nurse taking care of him. But his mind was as sharp as ever. I’ve taken more than a few pictures of him. The one he’s liked the most is the one that appears on the cover of Absolute Khushwant. I think the publisher (Penguin Books) had set up a meeting at 11 am for the shoot. We got a few shots and then within a few minutes he said he was done. I was hoping for more options so he asked me to come over at 7 that evening. I reached his place at 6.50 pm. He called in his domestic help and asked him to serve me tea. At 7 he pulled out his whiskey and showed no signs of offering me. I had to make do with a cup of chai that evening. But that was how he was -- always valuing time, especially his own, but always warm and gracious. I think I got close to him only over the last five odd years. I suppose I only matured to enjoy his company then. A few years ago when my wife and I were separated it was especially tough. As always, he was there. He was sad that it happened. But he was always, always there. Before I exhibited my series of photographs of Maoists, I showed him the prints and offered to gift him one. He selected one and asked me to enlarge it. I did and gave it to him. He took it and got it mounted on the wall right opposite to where he would usually sit. And to everyone who came visiting he’d tell proudly: Mustafa ki photo hai. Mustafa Quraishi has shot photographs for the Associated Press, Time magazine and The New York Times among other publications. He has also documented the world of Maoists in central and south India. 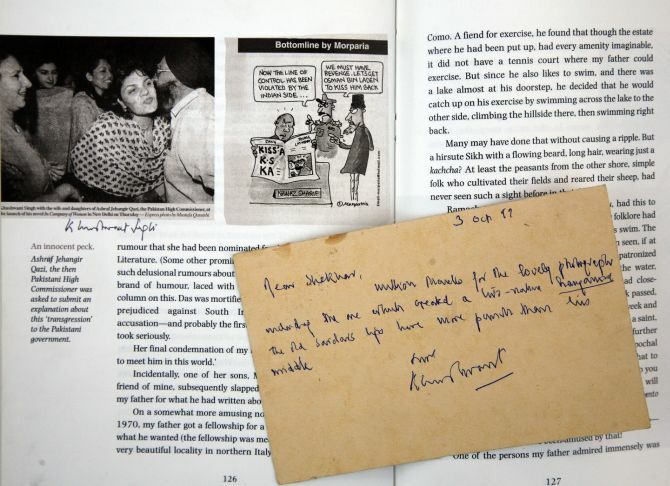 Image: A photograph that Mustafa Quraishi shot for 'The Indian Express' that appears in Khushwant Singh's book.